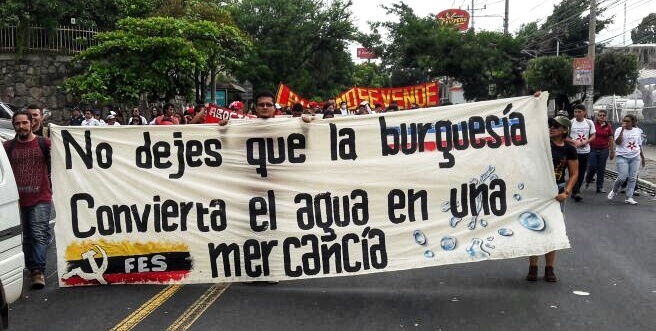 Thousands of University of El Salvador students march against privatization of water | Fight Back! San Salvador, El Salvador - Thousands of students came together at the main entrance of the University of El Salvador (UES), July 5, to march against the right-wing initiative of the Salvadoran oligarchy to privatize water. The protest was organized and led by the UES authorities. The large march was accompanied by the university community, where students, teachers and workers brought out colorful signs, banners and firecrackers. The protesters marched to the Legislative Assembly where the university community, led by Rector Roger Armando Arias, demonstrating the opposition of the Salvadoran people to the privatization of the vital liquid. “The struggle is to make sure the people don’t die of thirst,” said Arias.